Obviously I am a big fan of the Ernie Ball MusicMan guitars and basses. One complaint that I have heard from bass players is that the Stingray bass necks are too fat, and that they wish they had more of a Jazz Bass neck profile. 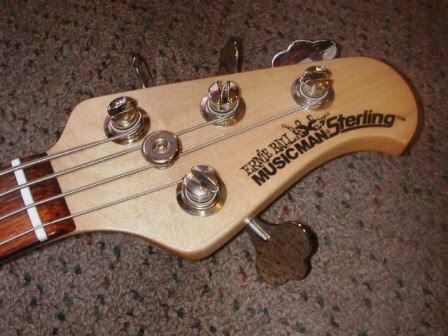 Haven’t these guys ever heard of the MusicMan Sterling bass? I guess not. The Sterling bass was introduced in 1993, about 10 years after MusicMan was bought by Ernie Ball. These basses have a slightly smaller body than a Stingray, and a Jazz Bass profile neck with a 1.5-inch nut. They use a 5-bolt (instead of 6) to join the neck to the body, so there is a little better access to the higher frets. Who uses those frets, anyway? The hardware is comparable to that of a Stingray, with Schaller tuners, and the high-mass MusicMan bridge. With a Sterling you can get almost the same electronics choices as you would with a Stingray: single humbucker, dual humbucker, humbucker/single coil, and a piezo option. They are all ceramic magnet pickups. On difference is that if you get a single humbucker bass, there is a hum cancelling phantom coil underneath the pickup (not that I have ever has a super-hummy Stingray). All of the basses come with a 3-band preamplifier with cut and boost. The one we have here today is a limited edition. It is finished in Copperhead Bronze with an anodized aluminum scratchplate. These were only available in 2004 from Guitar Center, and you could get a Stingray, Sterling or Stingray 5 in this finish. This one weighs in at almost 10 pounds, which is a little heavy for my taste. Of course, it played well (like all of their instruments), and the craftsmanship is superb. By the way, if you do prefer the Stingray shape and tone, but want a thinner neck, you are in luck. 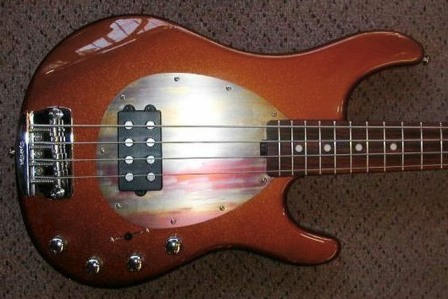 Last year they instroduced the SLO special, which will give you a Sterling profile neck on a Stingray body.